Three lemons to be exact. During George’s recent bud bonanza, I made a concerted effort to pollinate, pollinate, pollinate! Every morning, I’d go in with my Q-Tip, forcing pollen from one flower to the next and then making the rounds all the way back again. This is what must happen when you have a fruiting plant indoors (or on a 12th floor city balcony where the bees don’t care to fly). You can’t have fruit without fertilization, kids. For a while, we had about a dozen teeny baby lemons. Then they started dropping off, one by one, a familiar sight from the first time George had produced female buds. 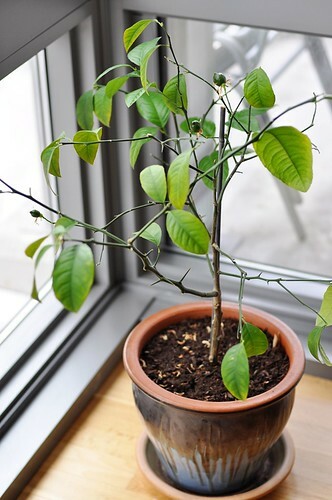 When we returned from Austin, I was pleasantly surprised to see that a few of the remaining lemons had begun to grow. Over the past couple weeks, we lost the rest of the nonviable babies and the growing lemons have begun to look like fat little green beach balls. We’re down to three, one of which still seems a bit of a toss-up, but I’m feeling optimistic. 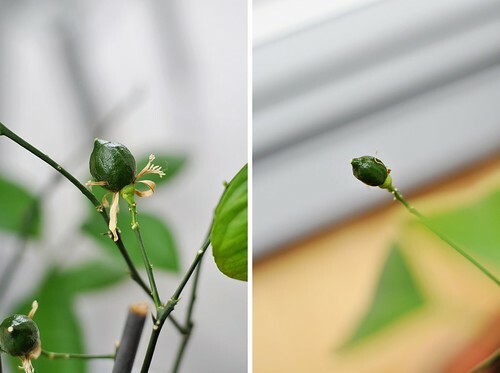 I do still need to find a way to balance George’s leaf growth with his lemon production; he’s lost about two thirds of his leaves since flowering. Maybe I over-watered him slightly in an effort to make the lemons stick, but I’m not convinced that that’s it. It’s a constant learning process, this whole gardening thing. I think I’ll claim success for this round, though. Leaves are nice, but it’s the lemons that we’re really after. … had "Meyer" for three years and then the last winter inside did him in. Good luck and let us know what happens and what advice you get. 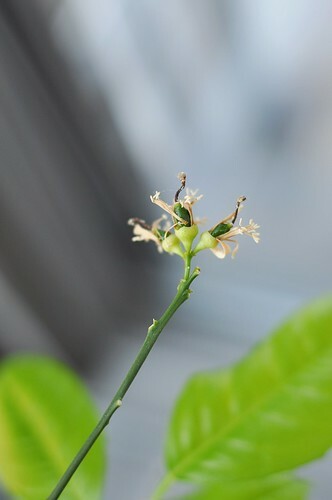 Our 3 yr-old Meyer lemon flowered for the first time this winter. What an amazing scent! There were a few baby lemons that showed up which immediately fell off, and the tree has since lost about 75% of it's leaves. Maybe the budding frenzy was too much for it.